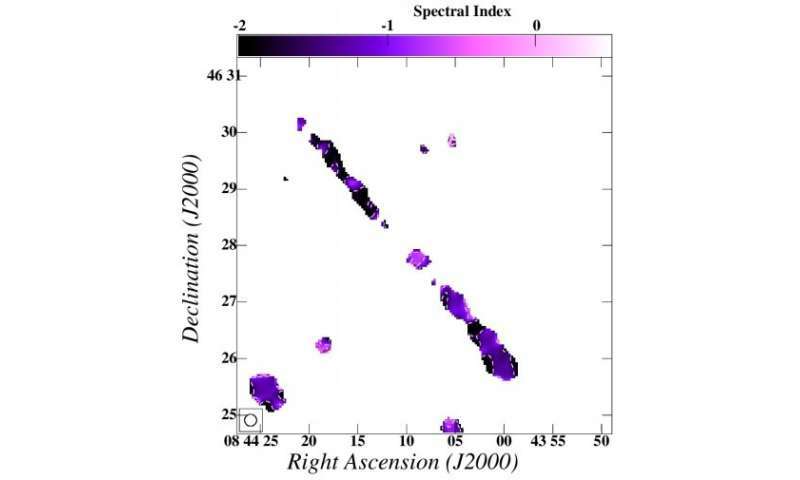 325-610 MHz Spectral index map of the giant radio galaxy. Credit: Sebastian et al., 2017. (Phys.org)—A team of Indian astronomers reports the discovery of a new giant radio galaxy (GRG) using the Giant Metrewave Radio Telescope (GMRT). With a linear size of more than 7 million light years, it is one of the largest GRGs known to date. The finding was presented October 17 in a research paper published on the arXiv pre-print repository. Recently, a group of researchers led by Biny Sebastian of the National Centre for Radio Astrophysics in Pune, India, was observing LBDS(Leiden Berkeley Deep Survey)-Lynx field with GMRT at 150 MHz, searching for high-redshift radio galaxies. They conducted deep radio observations with GMRT and spectroscopic observations with 2.0-m optical telescope at the Inter-University Centre for Astronomy and Astrophysics (IUCAA) Girawali Observatory in India. The astronomers found a giant radio source at redshift of 0.57 and determined its basic parameters. "We report the discovery of one of the largest and most distant Giant Radio Galaxies in the Lynx field, which was discovered using deep Giant Metre-wave Radio Telescope 150 MHz observations. (…) A candidate giant radio source was found in the field, beyond the half-power beam width with an RA DEC of 08h44m08.8s +46d27m44s," the paper reads. According to the study, the newly detected GRG has a linear size of 7.17 million light years, which makes it one of the largest GRGs so far discovered. Currently, with a projected size of approximately 16 million light years, the J1420-0545 holds the title of the largest giant radio galaxy known to date. The GRG found by Sebastian's team is linear in structure and shows no evidence for distortions in the bridges. The studied galaxy showcases edge brightening in the lobe towards the south, which could be due to a difference in environments. The researchers noted that it has the total flux density of 82.3 mJy at 325 MHz and a maximum age of 20 million years. The estimated age is usual for the general population of giant radio galaxies. The team also found that the new GRG shows some evidence for episodic emission. Moreover, the steep spectrum of its core suggests the presence of yet another pair of lobes unresolved within the core, which could indicate that it is a triple-double radio galaxy. "We also find that the core is detected at all four frequencies with a spectral index of 0.85, which is steeper than normal, hence we speculate that the core may be a compact steep spectrum source (CSS), which makes this giant radio galaxy a candidate triple-double radio galaxy," the scientists wrote in the paper. The authors emphasized the importance of their discovery. Given that the number of giant radio sources identified at high redshifts is low, every new detection in this field could be very helpful for studying the evolution of the radio galaxy population over redshift. We report the discovery of one of the largest and most distant Giant Radio Galaxy (GRG) in the Lynx field which was discovered using deep Giant Metre-wave Radio Telescope (GMRT) 150 MHz observations. The core is detected at 150 MHz and also in the VLA FIRST survey. Spectroscopic observations carried out using the IUCAA Giravali Observatory(IGO) provided a redshift value of 0.57. This redshift was later confirmed with data from the Sloan Digital Sky Survey (Data Release 12). The angular size of the GRG is 5.5 arcmin and at the redshift of 0.57, its linear size is 2.2 Mpc. At this high redshift, only a few radio sources are known to have such large linear size. In order to estimate the spectral index of the bridge emission as well as the spectral age of the source, we observed this source at L-band, 610 MHz and 325 MHz bands with the GMRT. We present the spectral ageing analysis of the source which puts an upper limit of 20 Myr on the spectral age. The better resolution maps presented here as opposed to the original 150 MHz map shows evidence for a second episode of emission. We also find that the core is detected at all four frequencies with a spectral index of 0.85, which is steeper than normal, hence we speculate that the core may be a compact steep spectrum source (CSS), which makes this giant radio galaxy a candidate triple-double radio galaxy.